How do I download a report of my campaign donations? Learn how to download a full report of donations made to a specific campaign. 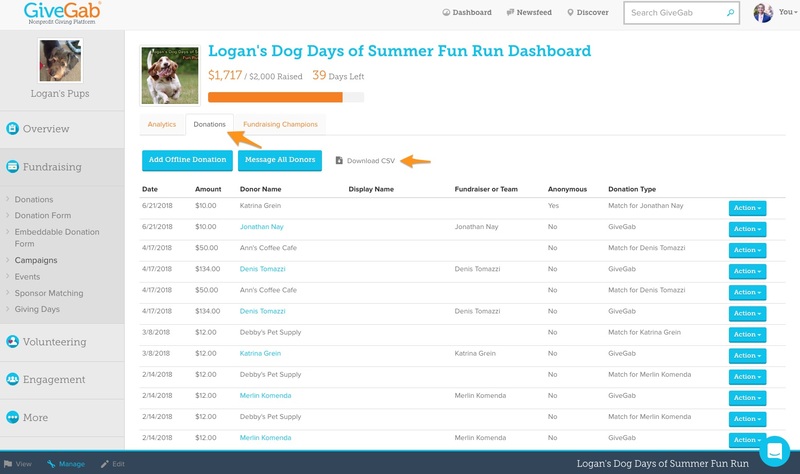 From the Overview Tab of your Admin Dashboard, expand the "Fundraising" Tab to select "Campaigns" from the dropdown. Click the "Manage" button within the campaign you're looking to access. You will see three tabs available within the Campaign Manager. Select the "Donations" tab in the middle to see all donations made for this campaign. From there, you click on "Download CSV" to the right of the blue buttons in your donations table. The report will be sent directly to the email address that you're currently logged in with! To learn how to read your exported report, take a look this article here!